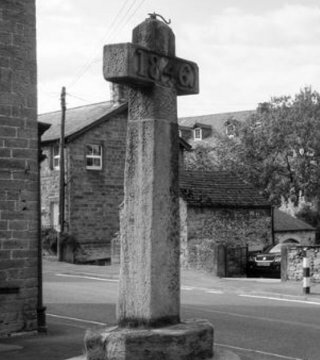 The Village Cross was erected in the village in 1846 to commemorate the repealing of the Corn Laws, laws first introduced in 1815; they imposed expensive duties on imported corn and other grains for grinding from other countries protecting the English and Irish farmers. The village cross, locally known as the Corn Cross is an important symbol and was protected in 1967 as a grade II listed monument. It is located directly opposite the Moon Inn public house at the junction of High Street and The Dale. It stands about 12 feet tall (4m) and is made from gritstone. 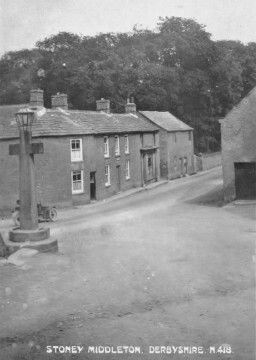 Originally it had a light on the top which was unfortunately knocked off during a prank by regular climbers who (perhaps worse for wear) decided to practise their climbing skills upon leaving the Moon Inn. the duties was to raise the price of home grown corn, which, whilst good for farmers caused much hardship to the people of the time. Many couldn’t afford to feed themselves properly, a situation that worsened dramatically at times of famine, causing prices to rise even higher. The laws were protected by many politicians as many had a personal vested interest in the unnaturally high prices; however a small number of politicians campaigned for many years to change the law, which they eventually did in 1846. Imported corn soon followed as did the price for corn which reduced dramatically, an event so important to the people of the time they made and erected the cross to commemorate it. Rich landowners were a long established group of people who were either politicians or had influence upon them fought hard to protect these laws which were highly advantageous financially. In contrast the newer industrialists and workers who were bitterly opposed and campaigned to repeal it were under represented in parliament. Their argument was that a removal of the laws would allow corn to be imported and consequentially the price would fall, thus allowing the poor and middle classes to be able to afford to buy bread an important and staple food. This would further provide the workforces of England spare cash which in turn would be spent on manufacturing goods, and in return employment wold rise and further improve the economy. It was also argued that the lower prices would increase demand and therefore allow the agricultural industries to become more efficient. Collectively very strong arguments, however the rich and unfeeling, unprincipled landlords whose self-interest and greed drove them to fight for the laws to remain. Whilst the laws were popularly known as the Corn Laws they actually came into force as a result of the Importation Act 1815 and related to all grain that required grinding and particularly applied to wheat. The price of grain was particularly influential upon other important staple foods, foods that the average working man spent most of his wages upon, making the laws extremely controversial. It was the famine in Ireland in 1846 which was to have significant influence in bringing about the change to the Corn Laws. The famine had caused much hardship and there was an urgent need for foreign imports. It was Prime Minister Sir Robert Peel, a conservative minister who was successful in finally achieving the repeal of the corn laws. Although not supported by the majority of his parliament he fought hard to progress the passage of the legislation. It was the 27th January 1846 when Prime Minister Peel outlined his plans to repeal the laws, stating the laws would be abolished on the 1st February 1849, this would follow three years of gradual decline in the tariffs leaving just 1 shilling per quarter. On the 15th May 1846 at the end of the bill of repeals third reading it was passed by a majority of 98. Following the repealing of the corn laws the price for corn reduced dramatically, due in part to the increased efficiency of transportation both by sea and by rail, but also to the increased efficiency in farming techniques and the modernisation of farming machinery. Specifically the prairie farmers of north America and farmers of the Russian empire who were able to export vast quantities. Farmers in England and Ireland generally did well due to the increased demands, allowing them to produce grain more efficiently.